Visit Udaipur, famous for its famous and beautiful lakes and palaces in all over the world. 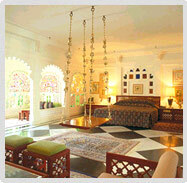 Decide your favourite colour and pick a city to match, Rajasthan's kaleidoscope of colours covers all. Bastions of history, bristling with memories, these splendid treasures stand battling the vageries of time. The desert sands shimmer and pulsate with an energy and a spirit of festivity permeates the air, every season provides many reasons to celebrate. Ride a camel over the dunes or horses through the hillside, speed ahead in a jeep and camp under open skies. A delicate ecosystem, part desert part marshy lands and even a small section of lush water filled valleys, sports a wildlife rich in variety. Whichever Budget Hotel you choose you will always experience a traditional hospitality that you may never want to forget. 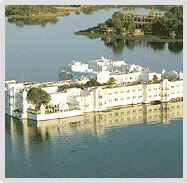 The famous Lake Palace hotel rises out of the waters of Lake Pichola like a mirage in white marble. One of the most beautiful palaces in the world, it seems to have been spun out of a fantasy. Originally built as a summer resort for the royalty, when it was converted into a luxury hotel in the 1960's, its stunning location put Udaipur on the international tourist map. Built on four acres of natural rock foundation its architecture reflects the glorious Mughal designs inherent in the magnificent structures of Agra. It has courtyards lined with columns, pillared terraces, ornate glasswork, intricate paintings, Hibiscus laden gardens and fountain pavilions. 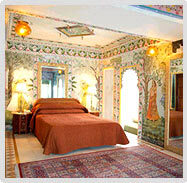 The rooms are decorated with cusped arches, inland stones of pink, and green lotus leaves and painted mirrors. With open-air courtyards, marble swimming pool and magnificent terraces apartments like the Bada Mahal, Kush Mahal, Ajjan Niwas, Phool Mahal and Dhola Mahal, it is deservedly famous for its ethereal and aesthetic beauty. This whispy white and magically romantic palace is a huge draw for wedding parties, it has seen many a white wedding dress flowing along its magical main terrace, which has an extraordinary view and sits above a lotus pond. The shimmering turquoise waters of Lake Pichola surround the Lake Palace and enhance its mistique. The Lily pond, in the centre of the palace seems an extension of this aesthetic watery ambience. Amidst these outrageously incredible views, dining is a pleasure during the day and the setting is no less than magical during night time. Soak in its peace and tranquility, gently lapping lake water, glittering lights and haunting strains of music from across the shores. The city of Udaipur, steeped in mystery and romance asserts a magnetic pull for travellers, writers, poets and painters alike. This city of dawn sits in a picturesque setting, surrounded by hills and mountains and set on the edge of three lakes, it is a dreamy desert oasis. Its narrow streets lined with vividly colored stalls, gardens, temples and palaces mirrored in the placid blue waters of lake Pichhola, add to the magic that is Udaipur. In all the Lake Palace houses 84 centrally air conditioned rooms, 17 of these are gorgeous suites and 53 are sumptuous Deluxe rooms. The rooms and suites are exceptionally well decorated, each has a particular theme and is decorated with textiles and handicrafts of the region. The rooms are enlivened with silks, artefacts, ornate furnishings and intricate paintings or murals, and well equipped with mod cons. The rooms offer panoramic views of the lake and the city beyond. The suites also include a living room and private balconies. All the rooms include phones with international direct dial facility, channel music, colour television with satellite programmes and 24 hours room service. Some other services provided by the hotel are secretariat service, swimming pool, beauty parlour and massage centre, travel desk, car rental, shopping arcade, currency exchange, electronic safes in all the rooms, doctor on call and babysitting. The palace was built for leisure and this tradition still carries on, the guests are treated to fine performances of dance and music, puppet shows and parties are often arranged on the barge. An astrologer sits outside the lobby entrance and is always happy to tell you your future. Chess and many other games can be enjoyed when you feel like spending time indoors. The royal banquet halls are now reception rooms, bars and restaurants. Apartments namely the Bada Mahal, Khush Mahal, Sajjan Niwas, Phool Mahal and the Dhola Mahal add to the romantic setting and give a taste of the regal splendor of a bygone era , they also boast of a restaurant, a coffee shop and a well appointed lobby with jewellery and souvenir shops. Catch the early morning sun rise over the still waters of the lake as you bite into freshly baked croissants and enjoy a sumptuous breakfast at Jharokha, the 24 hour lakeside cafe. The best setting also for a a steaming cup of coffee and good conversation. The shimmering lake at night will only add to the experience of being served delectable dishes, once created only for kings and queens. A restaurant facing the lily pond, serves both Indian and Continental cuisine. The highest rated though is the delicious Rajasthani cuisine that is available here. Is the poshest watering hole in this desert oasis, after all it is Lake Palace's lounge bar. Decorated with intricate glass mosaic work on the walls and ceiling, it has a fine collection of both soft as well as hard drinks.